These are the three words that I am currently living with. Save money and automatically add in to the investments. It is hard especially for someone like me that’s in my 20’s and just on my first few years of earning without that much responsibility. Whenever I talk to someone and they ask why and how I became so passionate about financial management I always answer that I have no idea. I guess its just that I earned my own money at an early age so I understood the value right then. I am the kind of investor who thinks of long term jut because I got into the investing world really early. I can take big risks on my money for again my money principles just dictate every financial decision that I make. But I know that not all investing story ends with a happy ending. When you invest in something you put not just the money… but all the emotion and the hope that this could be something big in a long run. Imagine the emotional stress it could give if you failed in an investment. Remember in my post about Job Interview?! I shared the true to life story of Chris from Pursuit of Happyness and it was during his interview as a sales broker. His story still relates to today’s topic for remember how he got into so much financial trouble when the investment that he made on bone scanner suddenly did not go very well. He lost his wife, he lost his life and he really experienced being broke. 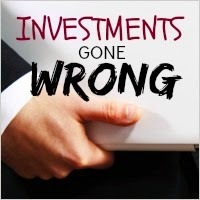 The above story is something that one won’t want to experience and I believe it is very relative to write about this blog topic especially now that most of us are excited when we hear the word “investment”. 1. Listening to Bad Advice. Be careful when it comes to choosing who to listen to when it comes to your investments. Once won’t listen to someone who doesn’t live what he/she preach. He/she must walk the talk. 2. Making the Bad Decision. The lack of financial knowledge is and will always be one big source why people make the wrong move when it comes to their investments. People think that investing is all about easy money but the truth is it takes enough knowledge for one to master how investments go. 3. Investing on the Wrong Time. There are instances that though everything is coming of a good term in the investment there are just things that doesn’t make sense. For example you just had invested in stock market but the economy suddenly faced a financial crisis. There are also those who had their investment and something out of hand happen such as emergency in the family of accidental death that could lead to losses. Be informed. Expand your financial knowledge. Read books or attend seminars that could give you a stronger backbone in terms of financial success. Diversify your investments. I included this in my Top 10 Most Important Lessons in Personal Finance before and this remains as the main goal of every investor. Don’t put all of your eggs in one basket. Learn to diversify your portfolio based on the type industry you invest with such as (real state, banking, construction and so on) or with the investment vehicle you want to invest with. Don’t be contended with plain searching… achieve financial education. Being educated in terms of money management is important and it makes me sad the the the current curriculum that we follow does not teach students financial knowledge during their younger age. Sometimes research is not just enough there should be action. Go for long term. Long term investments is the best way to go in investing but you need to have the courage to really let your money grow over time. Write you investment goals. Writing goals maybe not something that you feel comfortable to do but this is still one of the best way to seal the deal when it comes to investment is to have some motivational notes. Create your investment strategy. Success comes with a good investment strategy. Create the best route (don’t go for a fast-track without proper assessment). As always, every investment is a risk. The things that I have mentioned above won’t guarantee that your investment experience will be all good. I for example still has some nervousness on how my money will be in 5 to 10 years from now. But I believe what keeps me stable in the idea of Save and Invest is that it is investment is the only way that my hard earned money will earn by itself. Are you into investments too?! Do you have anything to share about your experience so far?! Use the comment section below so I can respond to your inquiry.